One of the easiest way to decorate your outdoor space on a budget is to create DIY garden crafts. Homemade garden craft ideas are so much more fun than anything you can buy at the store because they are unique and personal to your taste. Below you will find 29 cute and easy DIY garden craft ideas you can make in a snap to add a pop of personality to your yard. Whether your garden has a vintage vibe, is whimsical for your kids, or looks more traditional, you are sure to find projects that fit your style. For those who love to upcycle, this list has many fun tutorials. From tea cups to chandeliers to old table legs, you can make pretty DIY garden crafts out of almost anything! Liven up the rows of your garden with one of the easy to make garden marker tutorials. These DIY garden crafts also contain ideas for art and decorations to beautify your space from water features to stepping stones – weather your outdoor space is small or big. A whimsical pop of color is a fun addition to your cottage garden. 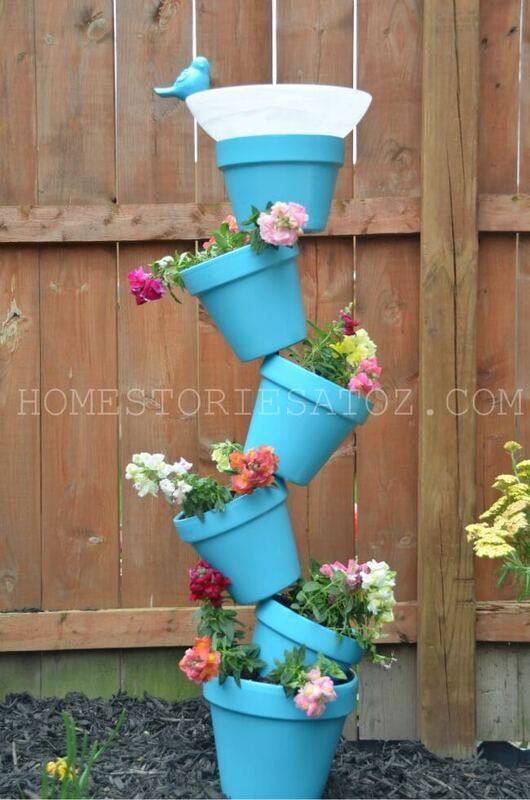 This unconventional use of containers has a Doctor Seuss quality that provides a vertical space to plant your flowers and a way to give the winged creatures of your garden a place to get a drink and a bath. Just because you are limited on space does not mean you have to have a boring flower bed. This stone spiral flower bed adds rich visual interest while allowing you to cultivate plants in a tiny space. The graduated spiral also gives you a deeper bed for flower roots to dig into. There is nothing more pleasant than looking out the back window to see a variety of birds flitting around your garden. 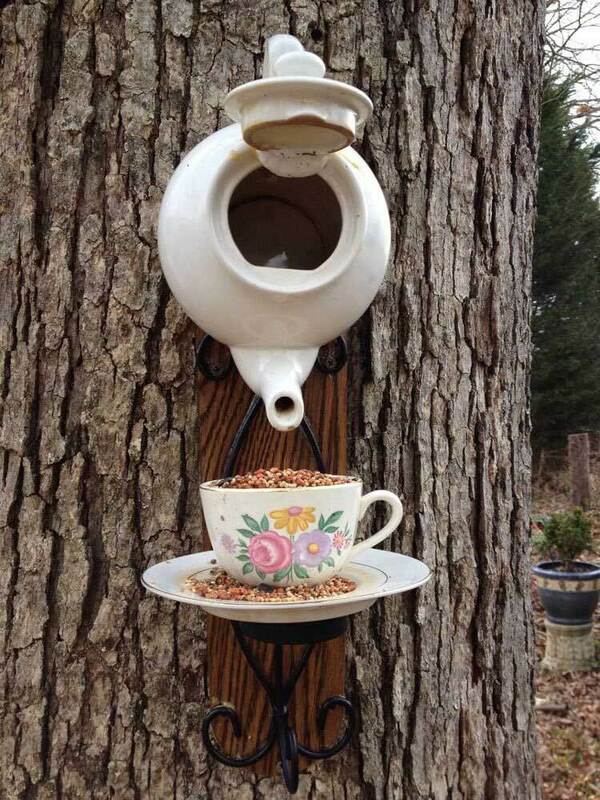 You can encourage them to visit your yard with this charming teapot bird feeder. It’s a great way to upcycle chipped tea cups and bring a bit of Alice In Wonderland to your garden. 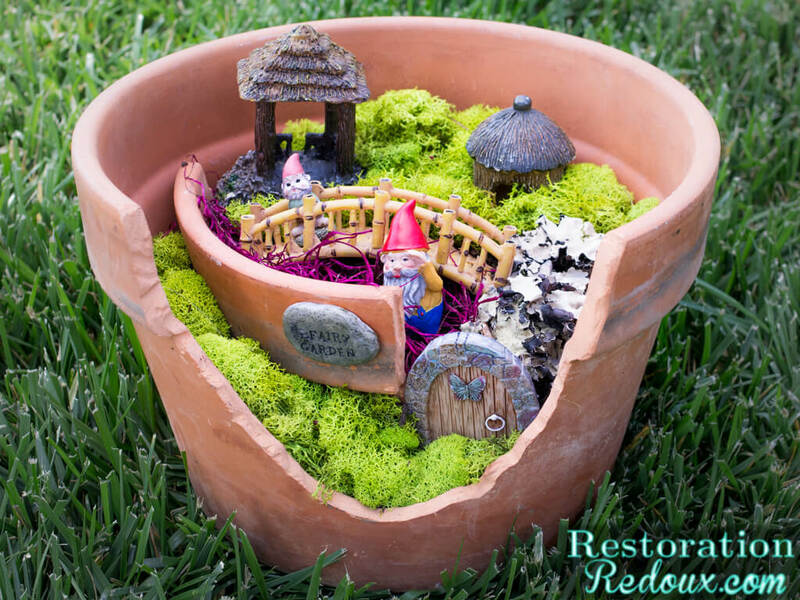 This adorable fairy garden will make you want to clap your hands to show you believe. 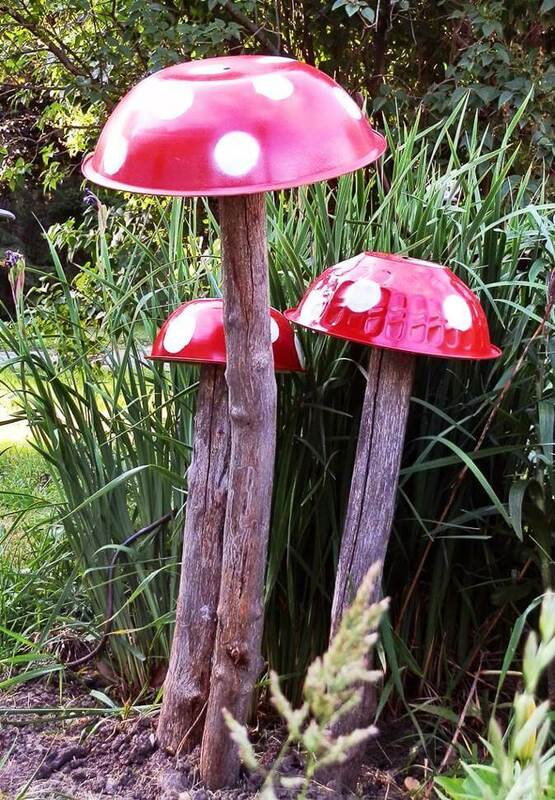 This is a great project to do with your kids that brings a little bit of magic to your garden. 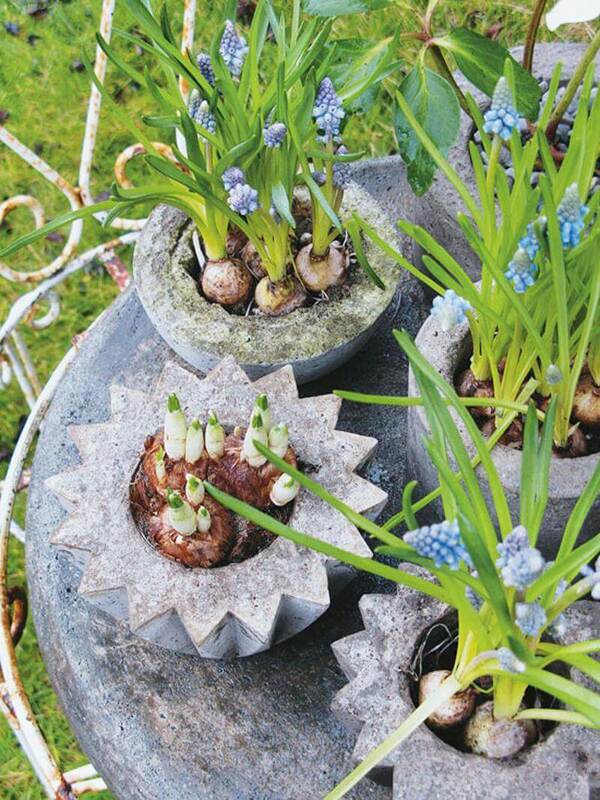 It’s also an easy way to keep broken terra cotta pots out of the landfill. It’s a delight to host miniature fairy tale characters in your own yard. 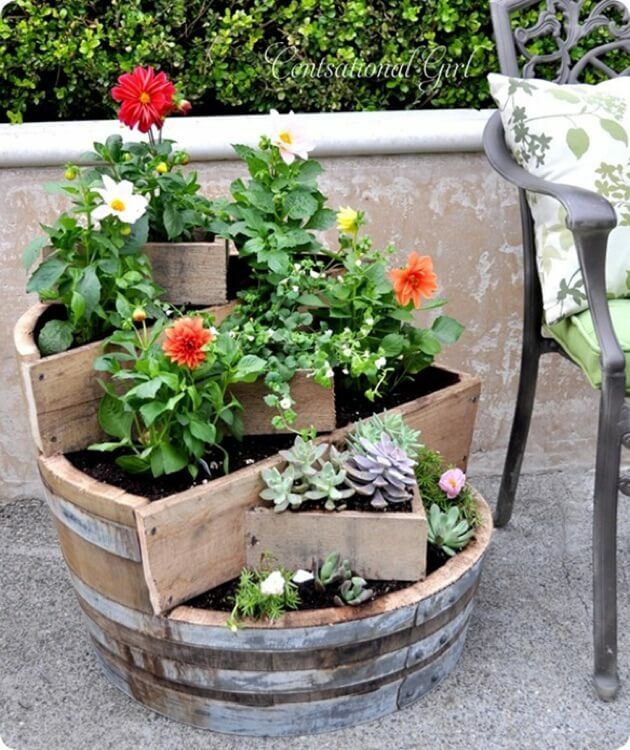 Wooden half barrels are a popular trend in rustic gardening. You can increase the planting space in the barrel and have a unique planter with this fun DIY project. The finished result is a piece that is far more interesting with greater depth and texture than a standard half barrel. When you combine old light globes, glass stones and paint, you can create a garden ornament that is truly original. Gazing globes are a garden tradition that adds an elegant pop of color. This project is an inexpensive way to add colorful sparkle to all the greenery of a garden in full bloom. Vegetable gardeners know the struggle of finding plant markers that do not blow away in a stiff wind or become sun faded. 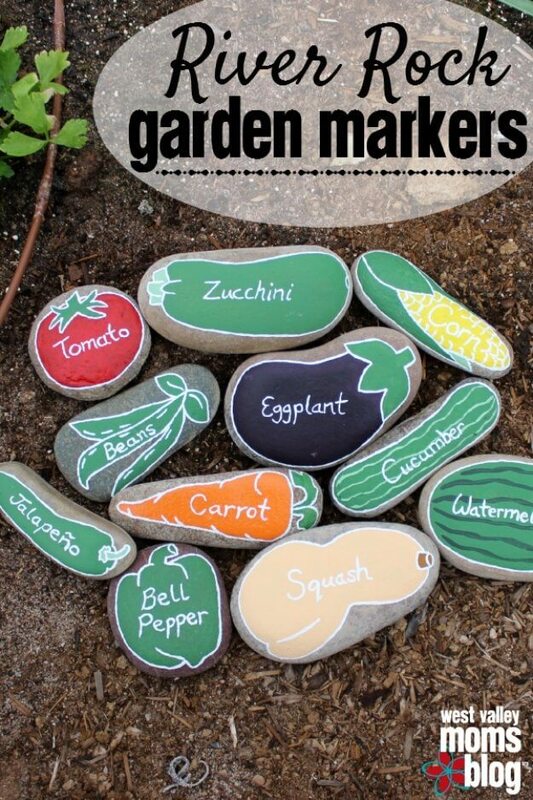 These painted river rocks are a fantastic customizable way to mark your plantings. You can even have your kids help with this project. You will end up with a marker that stays where you put it and does not fade. If you are looking for a one of a kind planter that can’t be picked up in every garden center, you should consider making your own. Using improvised molds and concrete, your imagination is the limit of what you can create. The end result is a stately arrangement of unique containers. An upcycled chandelier planter makes an elegant way to display hanging plants on your porch or patio. This planter is so easy and inexpensive to make, and the end results are stunning. You can leave the chandelier with its original metallic finish or paint it the color of your choice depending on the style you desire. 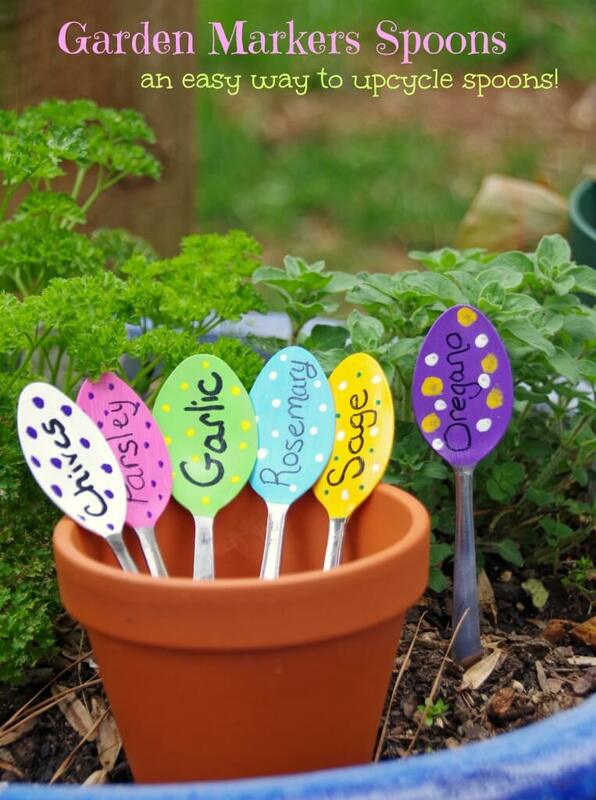 Kids love being involved in the garden, and these plant markers are the perfect way to add their creative touch to the vegetable beds. Spoons can be picked up for a song at any thrift store. All you need is a little paint, and you have cute markers to liven up plant beds. Keeping tires out of the landfill is important for a healthy planet. 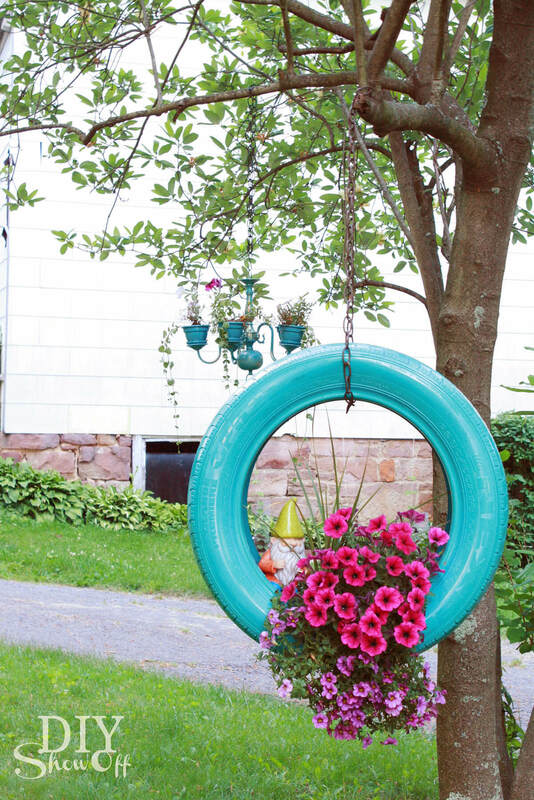 There may not be a cuter way to do that than this hanging tire planter. Give new life to a worn out tire by giving it a candy colored coat of paint and filling it with soil and a colorful display of your favorite blooms. If you shatter a favorite plate on the floor, don’t throw away the pieces. 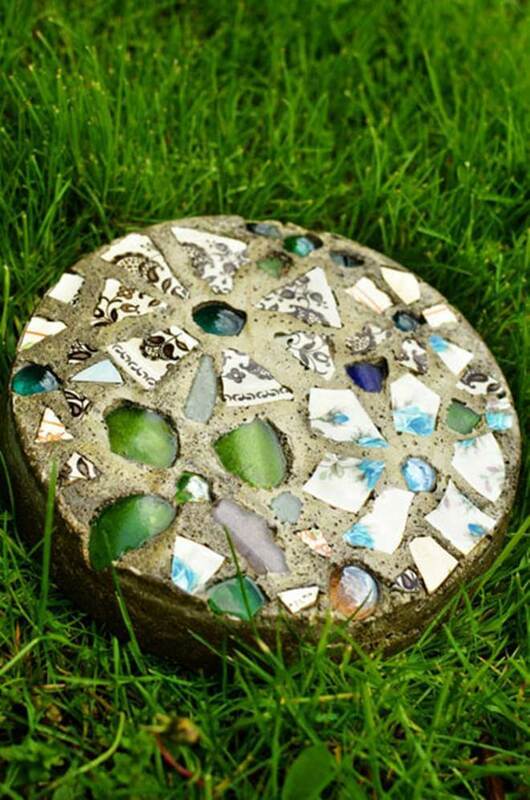 Use it to make these charming stepping stones. They are incredibly easy to make with a cake pan and a bag of concrete. The finished result is a garden path that is all your own unique design. Nothing says spring in your garden like really big dragonflies. 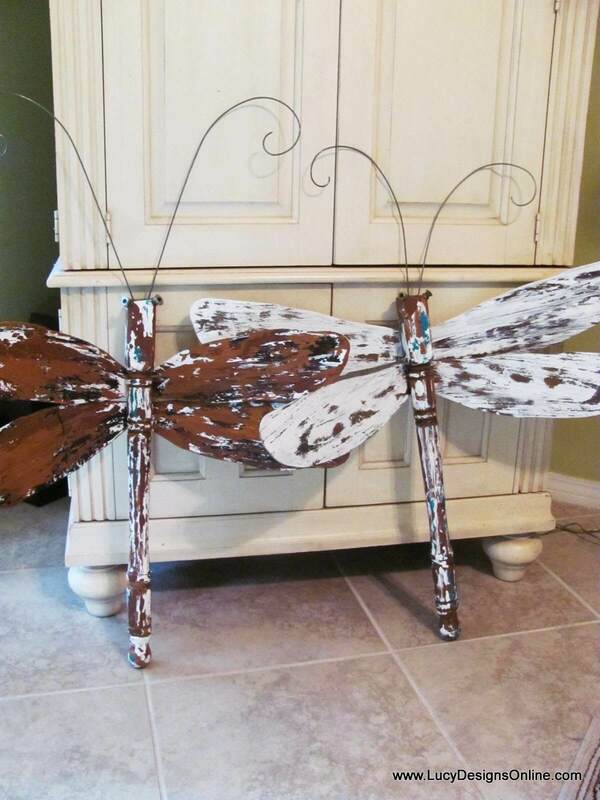 These four feet tall shabby chic creatures are made with old furniture legs and metal wings. You can use a variety of furniture pieces, such as cabinet knobs or brackets to customize their appearance. They look fantastic as decorations on a fence or porch lattice. If you are the type of person who spots a beautiful leaf and saves it to look at, you will love these DIY concrete leaves. You can permanently preserve leaves, paint them beautiful colors and use them as garden decor. The process is so simple that it makes a great project to do with kids. Every avid gardener knows that ladybugs are the sign of a healthy garden. 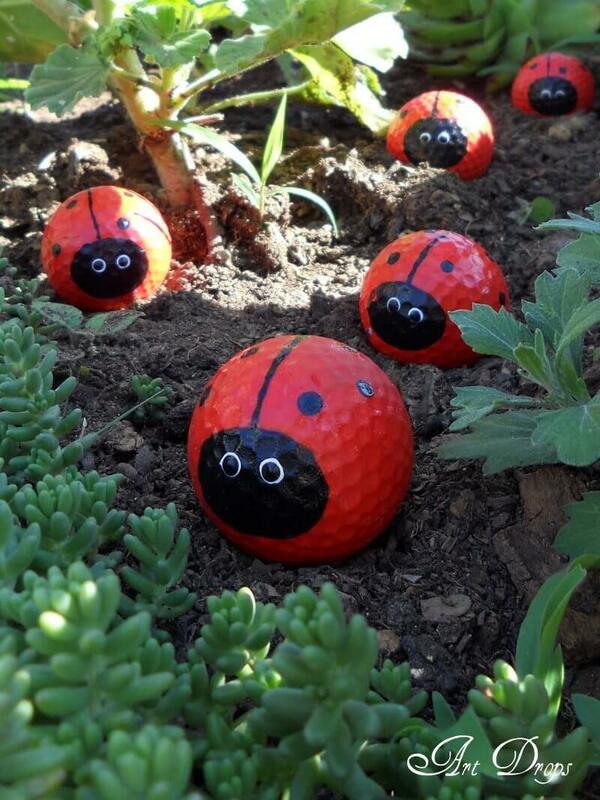 Now you can have lady bugs in your garden the entire year and upcycle your old golf balls. This clever DIY project turns boring white golf balls into bright, beautiful lady bugs that you can nestle in your garden beds for a pop of color. Coastal inspired garden decor adds a beachy theme to your garden, which can get you in the mood for summer. You can create your own planter that gives a gentle nod to the sea. 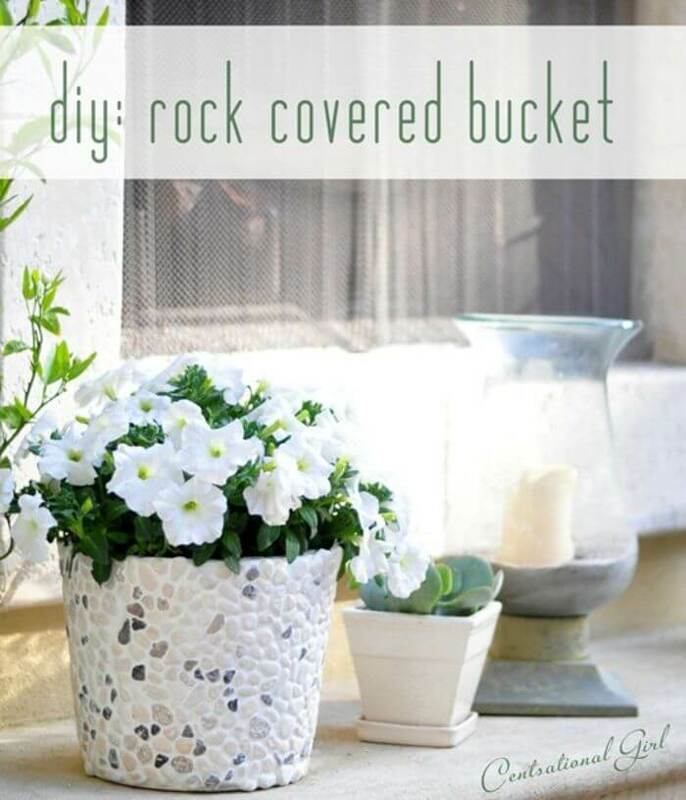 All you need is a metal bucket, river rock tile and grout to make a lovely container for your favorite plants. The gentle clinking of wind chimes brings to mind open windows, blowing curtains and a soft summer breeze. 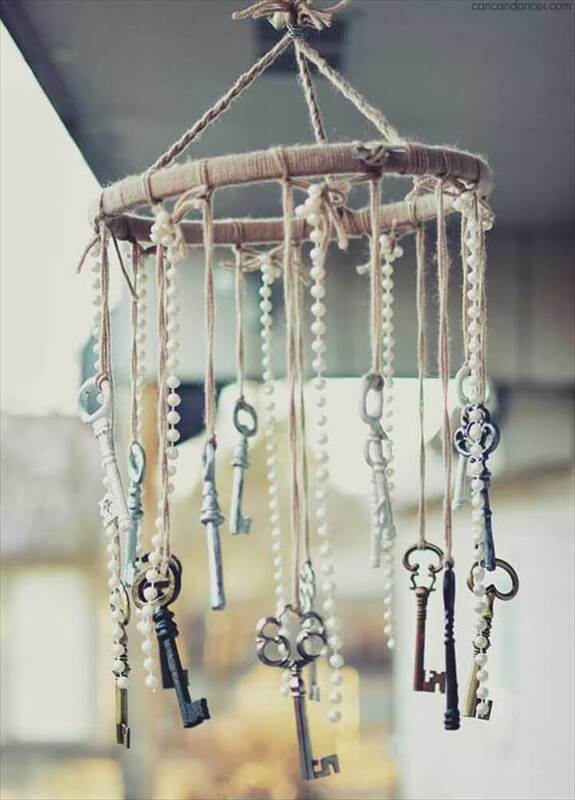 You can make your own elegant shabby chic antique key wind chimes using items that can be found at your local craft store. This porch ornament is a stylish way to add sound to your garden. 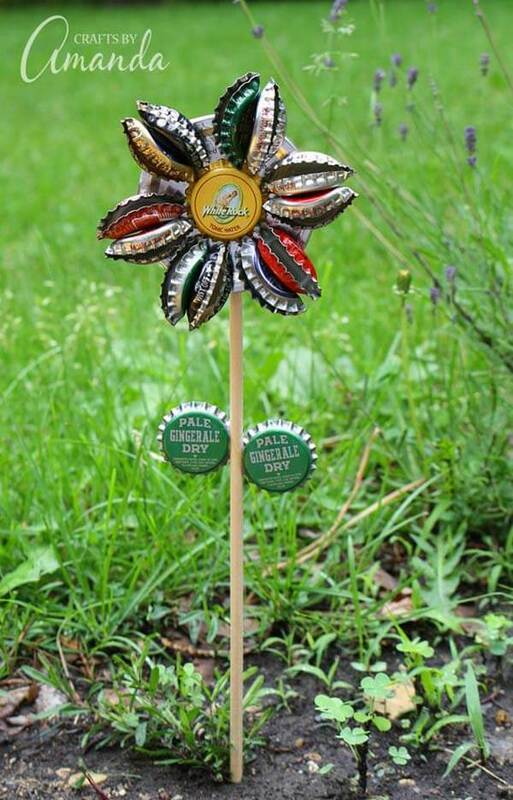 Bottle caps get a brand new life in the garden with this cute pinwheel. It is cleverly fashioned from the metal caps off soda and beer bottles that generally get thrown away. Make one to put in your garden for a whimsical decoration or a dozen to make a statement every time the wind blows. This rustic watering can planter gives you a picturesque way to display your flowers. Jeweled decorations coming out of the spout have the suggestion of water flowing out of the can. You can use a small corrugated metal can for a small planting or a larger one for a colorful arrangement of your favorite plants. 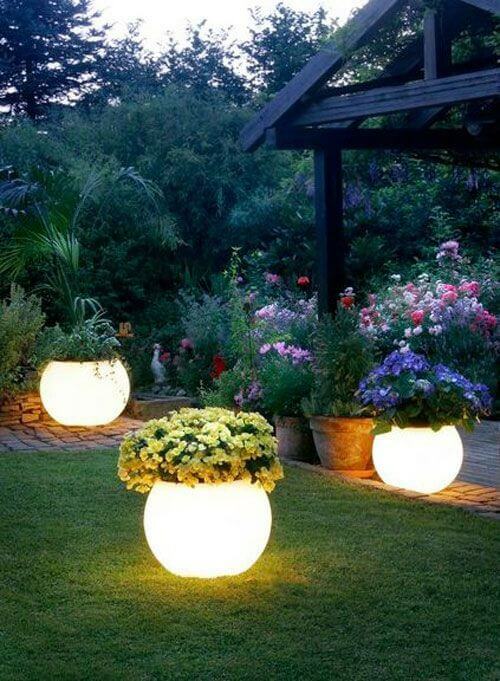 Add an element to your garden that you can enjoy after the sun goes down with these fun glow in the dark planters. This is a design that kids and adults can both enjoy. You can add a coat of glow in the dark paint to any container to instantly turn it into a softly lit planter in the dark. If you have always wanted a stunning water feature in your garden, look no further than this eye catching upcycled table fountain. The water runs gently down the glass, which is inserted vertically into the ground. The round shape along with the Zen quality make this water feature a great addition to an Asian inspired garden. 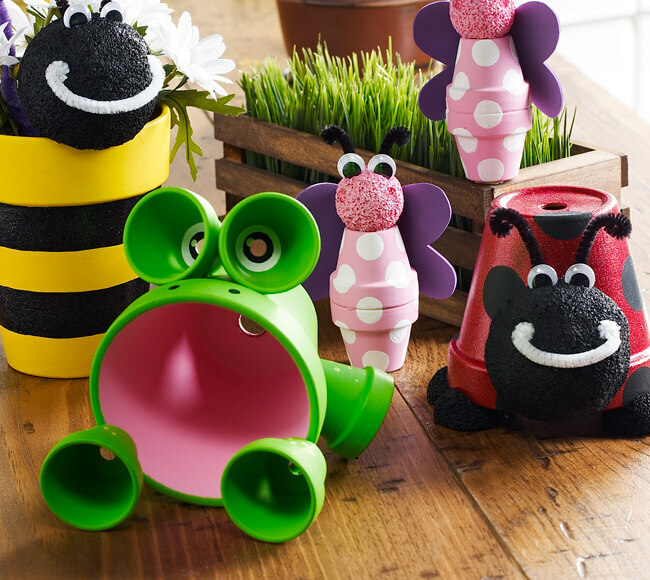 Parents who are passionate about DIY will love creating these flower pot animals with their kids. This cute project uses terra cotta pots stacked and attached in different ways to make a variety of critters. A few coats of acrylic paint and the imagination of young artists produces clay pot animals that make any garden a place the kids will want to hang out. 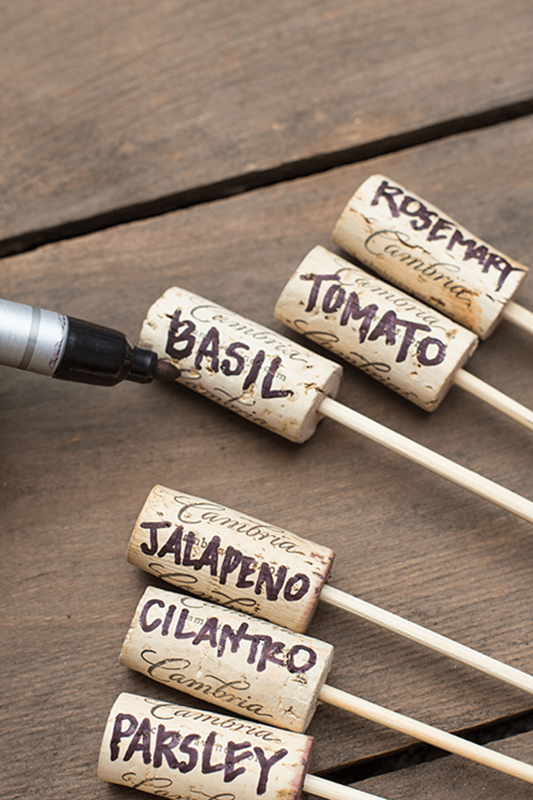 If you want simple, small plant markers for seed starting or keeping up with your young plants, you can’t go wrong with these sweet little wine cork markers. They could not be simpler to make, and you probably already have all the materials lying around your home. The end result is inexpensively made light weight plant markers. If you can’t have butterflies fluttering around your garden through all four seasons, you can at least have metal ones the whole year. 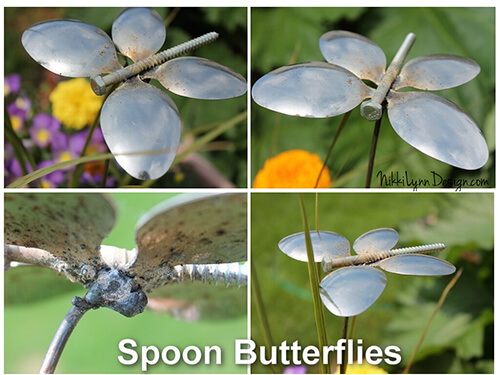 Garden art has never been cuter than with these butterflies made from recycled spoons and screws. They give an industrial art flavor to your favorite flower bed. Using mason jars in decor has been in vogue for several years now for a good reason. They lend a classic, rustic air wherever they are placed. 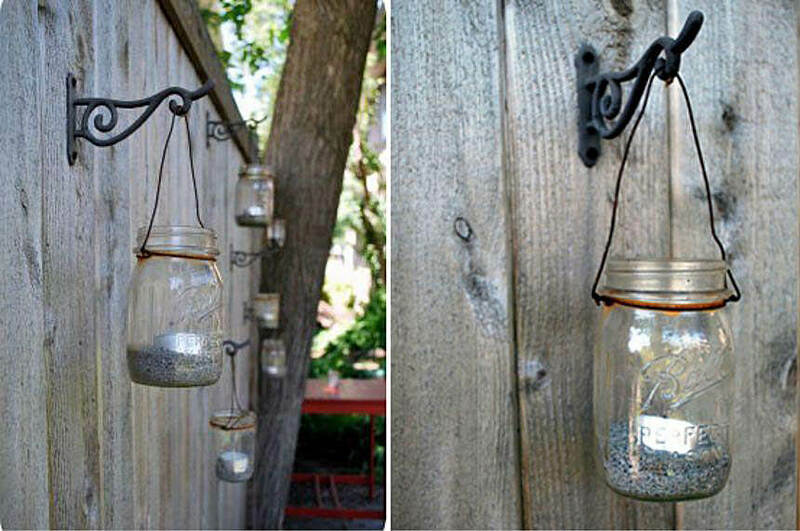 You can get this look for your garden with these easy to make mason jar lanterns. On a dark night, your garden will turn into a fairy tale with these lanterns giving a soft glow as they hang in branches. DIY enthusiasts who enjoy wine are always looking for new ways to upcycle their used wine bottles. 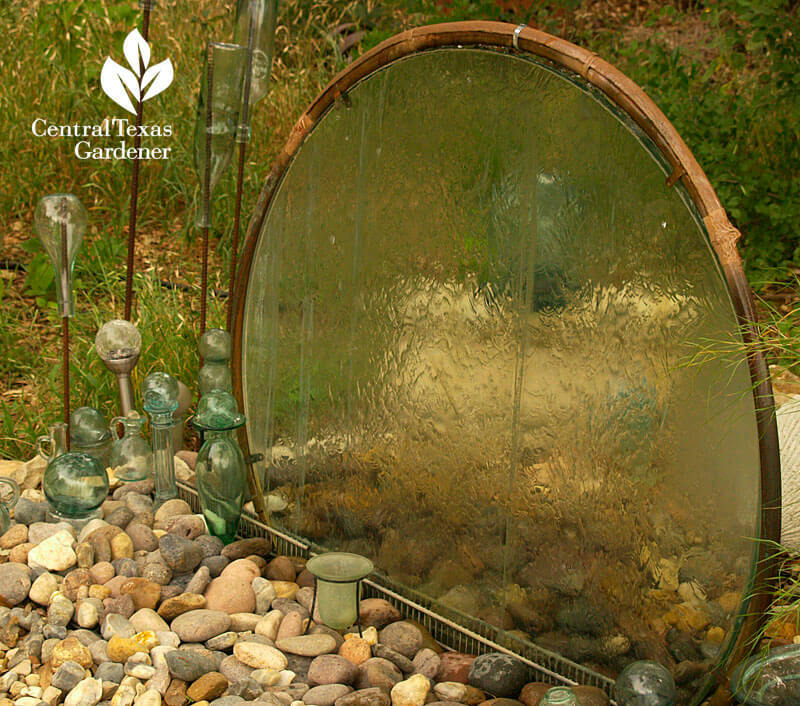 This project provides a way to use wine bottles and add a peaceful oasis to the garden. 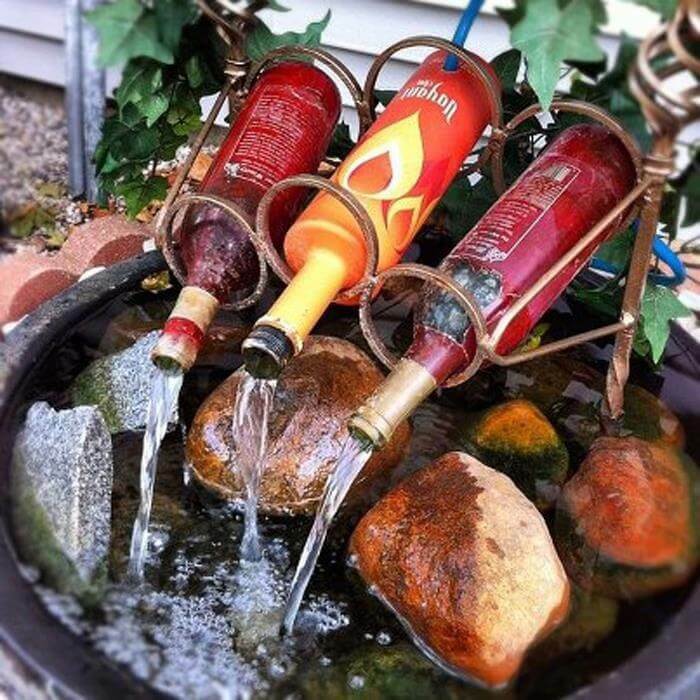 You can make this water feature as large as you wish by adding more bottles. 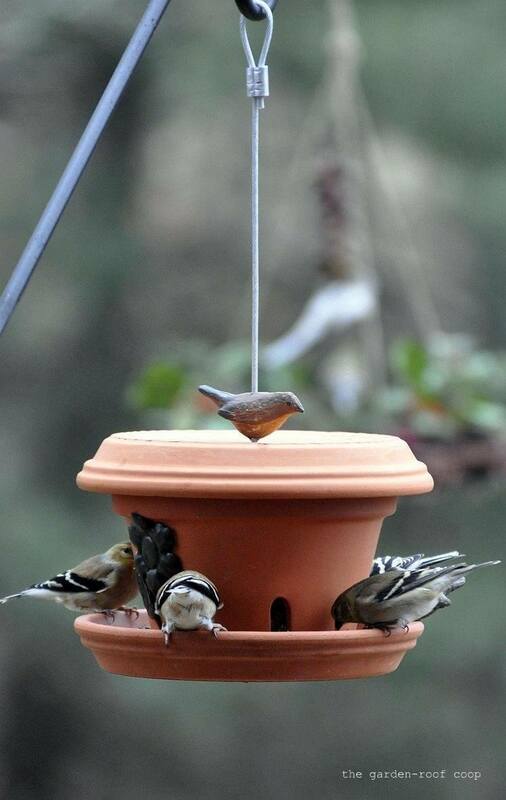 This bird feeder made from terra cotta containers is the perfect look for someone who prefers simple, neutral garden decor. The bird feeder is simple to construct and the end result is a beautiful place for birds to gather. As an added bonus, the opening is too small for crafty squirrels to steal a snack.